Arizona is a truly a traveler’s paradise! From top-rated golf courses and luxurious hotels & resorts to its spectacular natural beauty and world-famous attractions, the warm and friendly desert state of Arizona ensures there’s something for everyone to enjoy. And with year-round sunny skies, you never have to lose a day or two of your vacation due to inclement weather. World Travelers: See the magnificent Grand Canyon, one of the Seven Natural Wonders of the World, and brave the Skywalk if you dare. Luxury Seekers: Pamper yourself with treatments at Mii Amo, Travel & Leisure World’s Best Award winning destination spa resort in the Sedona Desert. 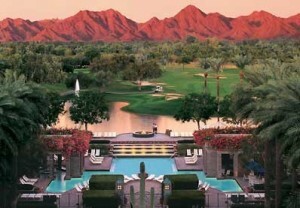 Or relax and unwind at the exquisite Hyatt Regency Scottsdale (pictured above). Outdoor Enthusiasts: Hike Camelback Mountain in Paradise Valley and watch spectacular sunsets from its peak. Foodies: Feast on scrumptious top-rated Soul Food at celebrity-frequented Lo-Lo’s Chicken & Waffles in Phoenix and Scottsdale. Sports Fans: Attend one of the four professional team games: Phoenix Suns, Arizona Diamondbacks, Arizona Cardinals, and Phoenix Coyotes. Or play a round at one of the top golf courses in the country. Design Aficionados: Tour Taliesin West, Frank Lloyd Wright’s home in Scottsdale. Fashionistas: Experience Arizona’s largest shopping collection of elite and exclusive brands at Scottsdale Fashion Square.